F.l.t.r. 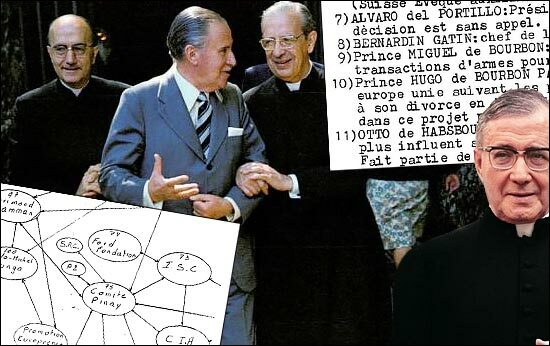 (minus the politician): Spanish Opus Dei leader Florencia Sanchez Bella, brother of key Cercle participant and Otto von Habsburg ally Alfredo Sanchez Bella; 1982-1994 Opus Dei head Alvaro del Portillo; and Opus Dei founder Jose Maria Escriva (1902-1975). 4. Blueprint for other establishments? "In my opinion, Opus Dei is a government onto itself. ... I am [also] of the opinion that Opus Dei should rule over all of Europe, and people who share my view of hierarchy and discipline should join Opus Dei. I am convinced that this is the only thing that can save Europe. Opus Dei will follow President Reagan." November 13, 1984, ARD magazine Monitor, Prince Michel de Bourbon-Parma in an interview with Jurgen Roth. Religions in Europe. Yellow is Islam, green is Russian Orthodox, Red is Roman Catholic and blue is Protestant/other. Especially in the blue countries many people are not rigidly religious anymore. So, what is Opus Dei? I remember running searches on Opus Dei in LexisNexis and all Proquest newspaper archives a good number of years ago. These archives included most major Anglo-American newspapers plus a good number of minor ones, most going back to the early 20th century. How many insightful articles could be found on Opus Dei? Pretty much none. Turns out, there's one major exception. This is a very long article entitled Their Will Be Done, published in the July/August 1983 issue of the "new left" magazine Mother Jones. It has been available online for free and at the same url since March 2009, but for some bizarre reason I completely missed it until March 2019. The article is based on a year-long investigation of CIA ties to the Knights of Malta in particular, but also Opus Dei. Upon reading it, it quickly becomes clear that all the most fascinating bits and pieces on these two Catholic groups available online on third rate websites and forums, actually originated with this article. That includes many of the known elite U.S. names of the Knights of Malta. Absolutely fascinating is how Mother Jones describes from the start of the Cold War the CIA has not just been actively supporting and working with these groups, but actually actively attempted to penetrate them and put them in power at the Vatican. And also how these groups were tied to CIA-backed anti-"communosocialist" death squad activity in Latin America. The situation may have shifted a bit in this era of the fall of communism and mass Third World immigration, but the article quite clearly describes the CIA as the top dog; not the other way around. It's highly suggested readers go check out this excellent article. Other than this Mother Jones articles, and very similar to Le Cercle or the Knights of Malta, just nothing of substance has ever been written on Opus Dei in the English-language media. Sure, Opus Dei has been described as "extremist", "sinister" and "secretive", but in terms of specifics of its influence and which individuals or institutes belong to Opus Dei, there's almost nothing there. In addition, Opus Dei is generally described as operating separate from the more "moderate" Vatican leadership. Is this notion correct though? I myself didn't start to get any insights on Opus Dei until studying Le Cercle and the overlapping Dutroux X-Dossiers in the 2006-2007 period. All of a sudden I started to run into tons of politicians, businessmen, aristocrats and even leading noble families as Habsburg, Bourbon and Saxe-Coburg-Gotha belonging to Opus Dei or the Knights of Malta. In turn these families have been very close to families as Savoy, Thurn und Taxis and Liechtenstein, about whom similar rumors regarding intelligence and/or Opus Dei circulate. Key names from Great Britain (often Pilgrims-affiliated), and at least in regard to generational leadership of the Knights of Malta, include the Dukes of Norfolk, the Barons Mowbray, the Marquesses of Lothian and the far less old Anglo-Dutch Brenninkmeyer family. The Dukes of Norfolk in particular, with some of them known to be supportive of Opus Dei, have been British liaisons to the Vatican for centuries. In addition, Pope John XXIII (1958-1963), Pope Paul VI (1963-1978) and Pope John Paul II (1978-2005) all were very supportive of Opus Dei. Cercle founder and Opus Dei ally Otto von Habsburg. Essentially Opus Dei is the Catholic version of Christian fascism. How is it possible that Opus Dei is described everywhere as a bit of an eccentric, minority sect within the Catholic church, while its leadership actually consists of successive popes, various royal houses in Catholic Europe, many wealthy aristocratic families spread throughout Europe, and various important businessmen, ministers and heads of state? One gets the impression here that we're looking at a network that has been trying to revive and continue the Holy Roman Empire, ruled by the Vatican and allied noble and aristocratic families from the 5th century, when the Merovingian dynasty pulled together most of Central Europe into the Frankish Kingdom, until it was officially dissolved in 1806. Even after that, the Holy Roman Empire continued until 1918 as the Austro-Hungarian Empire, ruled by the Habsburg family, whose members served as Holy Roman Emperors for centuries on end. 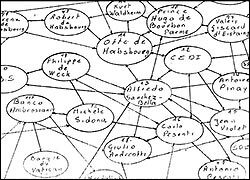 Subsequently we have Otto von Habsburg throughout the Cold War and beyond as a key figure in Le Cercle and countless other private Vatican-Paneuropa think tanks associating with businessmen and top politicians and intelligence officers all "rumored" to be loyal to Opus Dei. One wonders, why on Earth would the press - certainly the English language press - be quiet about such an enormous octopus? The Mother Jones article has been all but forgotten. A handful of books exist on Opus Dei, mainly in Flemish-Dutch and French and largely inspired by the French oil sniffer planes and the Italian P2-related scandals of the late 1970s and early 1980s, but still way too much information is missing. It appears, for example, that no one has ever even asked basic questions to what extent Opus Dei cooperates with the Knights of Malta and the Jesuits. The overlap with the Knights of Malta in the Vatican-Paneuropa network is just too obvious to dismiss. They essentially are the same group. As for the Jesuits, rumors exist they are more liberal than Opus Dei or the Knights of Malta. That may have went for Laurance Rockefeller favorites as Pierre Teilhard de Chardin, John Cobb and Disclosure Project con artist Daniel Sheehan, but it is very common for elite Catholic families involved with the Knights of Malta and Opus Dei to send their children to Jesuit colleges. One example is the billionaire Dutch Brenninkmeijer family, whom we could find in Prince Bernhard's 1001 Club. Opus Dei arms dealer Prince Michel de Bourbon with wife, Princess Maria Pia of Savoy. Here Prince Michel shares a board with Pilgrims Society Eastern Establishment families and top OSS and later CIA officers and assets. These ties make you wonder why the press has never exposed Opus Dei in any detail. The Brenninkmeijers also were involved in an order named the Equestrian Order of the Holy Sepulchre of Jerusalem. There are countless others of these international Catholic orders - such as the Sacred Military Constantinian Order of the Bourbon family, the Order of Saints Maurice and Lazarus of controversial former P2 Lodge member Prince Vittorio Emanuele of Savoy, or Portugal's Military Order of Christ - with no one having really tried to figure out how they all fit together and what role they exactly play in intelligence operations in particular. Some of the individuals invited to these orders, or the ones heading them, do seem to suggest some kind of private intelligence network. Quite possibly the biggest reason that no author or journalist has ever dug too deep into Opus Dei and the Knights of Malta is because these groups have been working hand-in-glove with the CIA throughout the Cold War in Europe's Strategy of Tension and Latin America's equally brutal Condor network. In fact, much of the leadership of the CIA belonged to the Knights of Malta or Opus Dei: the ones that we know of include relatives of Allen Dulles and George H. W. Bush; John McCone, William Colby and William Casey, with the notorious Ted Shackley - linked to the JFK assassination, the fascist-terrorist Strategy of Tension, and who was deeply involved in Le Cercle - at the very least having been a devout Catholic. The following report on Opus Dei was written in 1986 by Wavers BOB/Gendarmerie officers Gerard Bihay and Frans Balfroid. The BOB can be seen as the Belgian FBI. At the time of this report Bihay and Balfroid were in the process of investigating the murderous 1982-1985 Gang of Nijvel robberies. They also had experience with the equally notorious Pinon child abuse affair. Starting in 1983 the two detectives increasingly began to look into infiltration of the state, especially the Gendarmerie, by extreme-right pro-Nazi militias as Front de la Jeunesse and the Westland New Post. 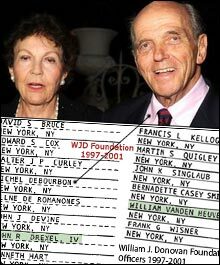 Looking at this report on Opus Dei, their investigation tied the activities of these militias to a European and U.S.-wide network involving aristocrats and nobles as Otto von Habsburg, the Italian P2 Lodge, the CIA, the Vatican, including Opus Dei; and the top level Cercle network, including its ties to the Britain-based Institute for the Study of Conflict and the U.S.-based Heritage Foundation. 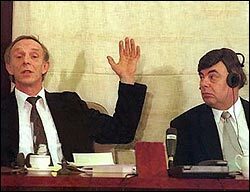 Franz Balfroid (left) and Gerard Bihay, here testifying during the second Gang of Nijvel Commission of 1996-1997. Incredibly, Depretre featured in both the Pinon child abuse affair and the much later Dutroux X-Dossiers as a member of an elite organized child abuse network, along with many of the Opus Dei-allied individuals listed in the report here. In August 1997, it actually again was Duterme who forcibly replaced the original X-Dossier investigators of the X1 child abuse case with much more questionable ones. X1 and a number of other X-witnesses fingered the exact same top level network as featured in the Pinon affair - and then some. Bilderberg participants on the liberal side and CIA-allied Opus Dei aristocrats and Nazi militants on the right featured in all these testimonies. Some of them are listed in this police report on Opus Dei. Maybe it should be mentioned that even the U.S.-based Franklin National Bank, around which the notorious Franklin child abuse affair would emerge, is mentioned in the police report in question here. Otto von Habsburg and his CEDI and Cercle ally Alfredo Sanchez Bella, whose brother was a Spanish Opus Dei leader, emerged as some of the most key figures in the Opus Dei network. Le Cercle was also considered a major nexus within the network. Clearly there was a cover up with the Gang of Nijvel, as there has been with related Gladio or "Black Orchestra" activities in Europe or elsewhere. It appears it generally involves the same group of conspirators each and every time, a good portion of it tying back to Opus Dei and the Knights of Malta. For the time being, the BOB/Gendarmerie report here is one of the few pieces of official documentation laying out these clandestine networks, the 1994 ATLAS dossier - also translated by ISGP - being one of the few other examples. That report dealt with a different type of establishment, however. For a PDF version of the report, including the diagram, click here. The report was provided to this author in 2008 by Cercle researcher David Teacher. I translated it in 2011, lost it, received it again from Teacher in 2015 and finally translated it again in 2017. Better late than never. OPUS DEI: Institution created in 1926 by Jose Maria Escriva de Balaguer y Albas. General Franco made him a member of the Order of Saint Raymond of Penyafort (founder of the Holy Inquisition in Aragon, Spain). Opus Dei has its origins in the Inquisition of which it is a rebirth with all the additional political and financial power. Rally ruling elites to its cause. Recruit future elites at universities and superior schools with the aim to indoctrinate them. Create disinformation through media they are able to acquire. Use criminals to achieve their goals (Mafia, P2, etc.). Create a climate of insecurity among the population. Change traditions and ridicule [that what is not supported]. Compromise independent leaders to their cause by any means. Corrupting the youth who do not share their ideas and render them harmless (drugs, prostitution, etc.). Destabilize states in order to be able to create a reshuffle and put in leaders who are conducive to its goals. (and this by any means, including terror, RTL). Remove any impediments to their goals in a radical way. The financial resources of Opus Dei: Opus Dei enjoys the support of many banks and different corporations, as well as the IOR of the Vatican. John Paul II was elected Pope by Opus Dei to serve its cause. Opus Dei has gained full power in Latin America, particularly in Brazil and Chile. Opus Dei would be at the base of the assassination of [Chilean] president Salvador Allende on Sept. 11, 1973 during the coup that brought President Pinochet to power. He benefits from the full support of Opus Dei. The present constitution, already published instructions, and those that may be published in the future, as well as other documents, cannot be disseminated. In addition, they cannot be translated without the permission of the Father (Balaguer). It is requested that all members of the Institute make every effort to insure, by total commitment, that the class which calls itself intellectual, and the ruling class of the civil society, adhere to the principles of our Lord Jesus Christ and apply them. Our goal is also to acquire all positions of power from where one can do many things, most notably perform apostolic work in the administrations of the state. Our members will thus be able to have access to careers and titles. A good way to operate is to acquire apostleship in diplomats positions, so that we have a prayer house in each embassy, ​​and that we can thus extend our influence to other countries. In large and the small ways push everyone you meet, urge them to come to my house. We must be a little crazy, but we must be ready to do whatever it takes to generate new converts. There's not a single soul on Earth to whom God did not send us. Our heritage includes the whole world, all the seas belong to us. The members of Opus Dei are acting either individually or under the guise of a cultural, artistic, or financial association that we call auxiliary associations. In their activities, these associations are inclined to be obedient to the hierarchical authority of the Institute [Opus Dei]. The effects of the subversive [communist] war in every country of the Atlantic Alliance in Europe and the USA. The effects of subversive [communist] warfare throughout the world: Korea, Vietnam, the Middle East, Portugal, [and the] routes of raw materials. The means for the Western bloc to in turn initiate a subversive action within the countries of the Warsaw Pact and within the [communist] contaminated countries around the world. Encourage countries of the Atlantic Alliance to undertake without delay the development of an ideological strategy that is capable of winning this subversive [communist] war, provided that it is offensive and powerful. The free circulation of people and ideas is an offensive tactic; we must find others. Consider establishing in the U.S. and Canada an action center for an offensive strategy. Free circulation of people and ideas. Jose Maria de Balaguer y Albas: Founder of Opus Dei. Javier Echevaria Rodrigues: Secretary general of Opus Dei since 1975. Cardinal Sebastiano Baggio: President Of The Pontifical Commission For Vatican State. Cardinal Marcinkus: Head of the Vatican Bank (I.O.R. ), tied to the Banco Ambrosiano scandal. Angelo Rossi: Administrative leader of the Apostolic Headquarters (A.S.P.A.). Alfonso Lopez Trujillo: Cardinal and former president of the Conference of Bishops of Latin America. With Cardinal Sebastiano and Bernard Gatin they form an all powerful force of Opus Dei in Latin America, notably in Brazil where they benefit from the help Carlos Boaventura Kloppenburg (Auxiliary Bishop of Sao Salvador da Bahia, Jose Freire Falcao (Franciscan Munster Archbishop of Brasilia) and Karl Joseph Romer (Switzerland Auxiliary Bishop of Rio de Janeiro). Alvaro del Portillo: President general of Opus Dei elected for life and whose decision is final. Bernardin Gatin: Chief of the Congregation of the Bishops. Prince Miguel de Bourbon [Prince Michel de Bourbon-Parma]: Arms trafficker for Opus Dei who carries out arms transactions for [Licio] Gelli (P2). Prince Hugo de Bourbon: Was destined to become the president of a united Europe, according to the plans established by Opus Dei. He was dismissed following his divorce in 1964 from Princess Irene of the Netherlands and replaced in this project by Otto von Habsburg. Kurt Waldheim: Former secretary general of the United Nations and current Austrian President. He was recently accused of deporting thousands of Jews while he was an officer of the Wehrmacht under Hitler. C.E.D.I. : The Centre Europeen de Documentation et d'Information was founded by Otto von Habsburg and financially supported by Alfredo Sanchez Bella. Alfredo Sanchez Bella: Spanish Minister of Tourism and Information from 1969 to 1973. His brother also was a leader of Opus Dei. Antoine Pinay: Former French prime minister and founder of the Pinay Committee (Pinay Circle). Occupies high positions in Opus Dei and extreme right movements. Jean Violet: French lawyer working for the CDCEC and the CIA. High functions in Opus Dei. Carlo Pesenti: A major industrialist whose business was closely linked to the Vatican and the I.O.R. (Vatican Bank), who died in September 84. Antonio Pesenti: Uncle of Carlo Pesenti. Was president of Banco di Roma and a friend of Mussolini. Giulio Andreotti: Former prime minister. Friend of Carlo Pesenti and Licio Gelli of the P2 lodge. He was also a member of P2. Philippe de Weck: Former president of Union des Banques Suisses (U.B.S). Appointed by Pope John Paul II as a member of the expert commission to reform the regulations of the I.O.R. [Vatican Bank] Involved in a business relationship with Carlo Pesenti and Michele Sindona. U.B.S. : Union des Banques Suisses. Michele Sindona: Sicilian banker involved in several bank scandals, such as the Banco Ambrosiano and Franklin National Bank affairs. He organized the assassination of magistrate Georgio Ambrasoli for which he is sentenced to life imprisonment. He died in his cell shortly after cyanide poisoning. Sindona benefited from help from the mafia. He had planned a separatist movement in Sicily with the help of the mafia. C.E.D.I. Belgium: Branch of C.E.D.I. It has its headquarters at Cercle des Nations at Avenue Franklin Roosevelt a Bruxelles. Joseph Meurice: Former Belgian minister. Co-founder C.E.D.I. Jean Vossem: Former secretary to the Belgian minister of the interior. Co-founder C.E.D.I. Maurice Schot: Former Belgian senator. Co-founder and member of C.E.D.I. Hubert Ansiaux: Former governor of the Banque Nationale Belge. Co-founder and member of C.E,D.I. Gaston Eyskens: Former prime minister of Belgium. Co-founder and member C.E.D.I. Hilaire LaHaye: Former Belgian senator. Co-founder and member of C.E.D.I. Paul Meyers: Former Belgian minister. Co-founder and member of C.E.D.I. Paul van Zeeland: Belgian minister of state. Co-founder and member of C.E.D.I. Robert Gillon: Former secretary general to the Belgian minister of economic affairs. Co-founder and member of C.E.D.I. Comte Jacques Pirenne: Former secretary to Kind Leopold II. Co-founder and member of C.E.D.I. Marcel de Roover: Industrial president for life of C.E.D.I. Jacques-Ernest Solvay: Important Belgian industrial in the chemical industry. Co-founder and member of C.E.D.I. Ernest-John Solvay: Important Belgian industrial in the chemical industry. Co-founder and member of C.E.D.I. Leon Antoine Bekaert: Important chemical industrial. Co-founder and member of C.E.D.I. Fernand Collin: President of the Krediet Bank Belge. A very important bank to Opus Dei. Member of C.E.D.I. Baron Yves de Brouwer: Head of an auxiliary company of Opus Dei. Daniel de Brouwer: Son of Ives de Brouwer. Member of C.E.D.I. Colonel Henri Bernard: Belgian army colonel. Member of C.E.D.I. Nicolas de Kerchove d'Ousselghem: Representative of C.E.D.I. Belgium to the C.E.D.I. International. Member of CEPIC (the former right wing of the socialist party the minister) and responsible for the political relations of the Ministry of Defense with NATO under the ministry of Paul Vanden Boeynants. Paul Vanden Boeynants: Former Belgian minister convicted for fiscal fraud. Paul Vankerkhoven: Secretary general of CEDI Belgium, member of CEPIC, friend of Paul Vanden Boeynants and Baron de Bonvoisin. Is well-known for his ties to rough extreme-right circles. 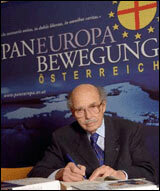 Baron Benoit de Bonvoisin: Former European representative of the Christian Social Party. Considered the "head" of the extreme hard right in Belgium. Is involved in several cases: Front de la Jeunesse, WNP and P [unreadable, possibly P2 or P7]. Robert de Habsburg: Brother of Otto von Habsburg. Lorenz de Habsburg: Son of Robert de Habsburg. Innsbruck president of J.E.S. (Junge Europa Studente Initiative). Husband of Princess Astrid of Belgium since Septembre 1984. Princess Astrid of Belgium: Belgian daughter of King Albert and Queen Paola of Belgium. Wife of Lorenz de Habsburg. [Unreadable]: European student initiative. Elite extreme-right movement [unreadable] at the l'Union Europeenne (M.A.U.E.). Jacques Jonet: Member of M.A.U.E. Former member of CEPIC. Bernard de Marcken de Merken: Member of M.A.U.E. Former chief of the NATO security service. A.E.N.A. : Action Europee Nouvelle et Atlantique. Became M.A.U.E. in 1965. M.A.U.E. : Mouvement d'Action pour l'Union Europeenne. Harsh extreme-right movement. Luc Beyer de Rycke: Member of M.A.U.E. European parliamentarian and administrator of Caritas Catholica. Robert Nieuwenhuys: Member of M.A.U.E. and former head of NATO's security service. Robert Close: Belgian general and senator of the PRL (Liberal Party). I.E.P.S. : The Institut Europeen pour la Paix et la Securite, an extreme-right movement campaigning for a rearmament of Western Europe with the idea to combat communism. Yves du Monceau de Bergendal: Vice president of I.E.P.S. and senator of the PSC (Christian Social Party). Heritage Foundation: Ultra-conservative American lobby largely responsible for the election of President Reagan. Has a tremendous influence on U.S. domestic and foreign policy. It is considered the nerve center of the Catholic Right in the USA. Burton Pines: Vice president of the Heritage Foundation. C.S.U. : [German political party in Bavaria that serves as a] branch of the Heritage Foundation. Franz Joseph Strauss: Head of the C.S.U. Hanns Seidel Foundation: Part of the C.S.U. U.S. Council for World Freedom: American section of the W.A.C.L. Count Hans Huyn: Member of the I.E.P.S. and the C.S.U. The Monday Club: British right-wing think tank of Thatcher. Brian Crozier: An English journalist linked to the CIA via the Institute for the Study of Conflict (ISC) of which he was the director (1979). Currently works for Transnational Security which is an extreme-right movement. I.S.C. : Institute for the Study of Conflict, a branch of the CIA funded by the Ford Foundation and the Pinay Committee. Ford Foundation: Branch of the CIA charged with analyzing the possibility of conflict around the world. Pinay Committee: Extreme-right movement with very close links to the CIA, ISC, P2 and the SDECE. Founded by Antoine Pinay. Transnational Security: Extreme-right movement founded by Brian Crozier. Jean Gol (Goldstein): Minister of justice and member of the I.E.P.S. Willy De Clercq: European Commissioner and member of the I.E.P.S. Paul Hatry: PRL (Liberal Party) minister of the Brussels region. Louis Olivier: PRL minister of public works. Louis Michel: President of the PRL. Europaisches Institut fur Sicherheits Fragen: Branch of the I.E.P.S. in Luxembourg founded on April 5 1982 by Leo Tindemans and Otto von Habsburg. A.E.S.P. : Academie Europeenne des Sciences Politiques. It is linked to the Paneuropa Union and involves Otto de Habsbourg, Giulio Andreotti, Antoine Pinay, Alfredo Sanchez-Bella and Jean Violet. Union Europeenne: This movement served as a liaison between the M.A.U.E. and the A.E.S.P. [Unreadable]: Belgian politician and member of the A.E.S.P. [Unreadable]: Former Belgian minister and member of the A.E.S.P. Georges de Lovinfosse:: Belgian army colonel and member of the A.E.S.P. Alain de Villegas de Saint-Pierre Jette: : Member of the A.E.S.P. Palys a role in the "sniffer plane" affair to the detriment of the French [unreadable] Elf Aquitaine. [Unreadable]: "Inventor of the sniffer planes." Valery Giscard d'Estaing: Former French president involved in various affairs (notably the diamonds of emperor Bocassa and the sniffer plane). He would have had many contacts with Gelli and his P2 lodge and would currently be the main leader of the SAC. Charles Ferdinand Nothomb: Son of Pierre Nothomb and interior minister of Belgium. Florimond Damman: Chairman of M.A.U.E. and the A.E.S.P. Extreme-right extremist whose aim was the reorganization of Europe and the fight against the "moral decadence of the West". Member also of Cercle Pinay. A.A.A. : Argentine Anticommunist Alliance. Spanish extreme-right movement linked to the WACL which is also linked to the Cercle des Nations. Aldo Michel Mungo: Member of the AESP. Collaborator of Florimond Damman. Delegate administrator of Promotion Européenne and founder of the Belgian Youth Movement. Father Dubois: Involved in the sniffer planes affair and works for the SDECE and the intelligence service of the Vatican. Father Marmier: Swiss correspondent of the Pere Dubois. Marcel Clement: Principal head of the Pinay Committee. Jean Ousset: Founder of the "CITE Catholique" organization, a fundamentalist group branching around the globe and branch of Opus Dei. Prince Jean de Broglie: President of the Sodetex (subsidiary of Matesa). Right-hand man and "friend" of Giscard d'Estaing who himself owned a large amount of shares in Sodetex. Jean de Broglie, thanks to his positions, succeeded in transforming fake treasury bills (French) into real money to the tune of several billions. Transactions were made via the SAC. He was assassinated in Paris in 1976. One of the sponsors of the assassination was Pierre Debiset (boss of the SAC). The organizer was Roland Luperini. Sodetex: Financial company owned by Matesa. Matesa: Financial company established in Luxembourg. Louis Meleux: Head of the company Meleux (who worked for the l'Etait Francais) found dead in the forest of Fontainebleau in 1966). When checking the accounts of this company we discovered a hole of several million French Francs. This vanished sum had been invested in Spain by Banco Popular Espanol. Banco Popular Espanol: An Opus Dei bank. Banco Ambrosiano: One of the banks of Opus Dei which allowed a $1 billion divert to the detriment of the IOR (Vatican Bank) in favor of Opus Dei and with the complicity of the banks of Michele Sindona and Franklin National Bank. Of the recent Banco Ambrosiano scandal. Roberto Calvi: The head of the Banco Ambrosiano who was found hanged under a bridge of the Thames in London while he was in this city to negotiate the repayment of the sum diverted by Opus Dei. After the [unreadable] fraud of Banco Ambrosiano, Opus Dei poured 250 million [unreadable] to this one and the rest was backed by the IOR (Vatican bank). P2 Lodge: Extreme-right group created on order of the authorities [unreadable] by Licio Gelli under the cover of a Masonic lodge. The purpose of the group was destabilization by terror. It was behind the  massacre at the Bologna station. After his arrest, Gelli managed to evade capture thanks to many co-conspirators and sought refuge [in] Brazil in the province of Mato Grosso in the [vicinity] of Dr. Mengele. Lopez Rega: Member of the Argentine Anticommunist Alliance (A.A.A.). Allianza Argentina Anticommunista: Extreme-right parallel police of the Peron regime. Xavier Gonzalez: Vicar general of Opus Dei for Belgium (1985). Herve Pasqua: Leader of Opus Dei having global contacts with different groups and in charge of the recruitment of future elites in academic circles for Opus Dei. William Colby: Former director of the CIA. Moon sect: American sect working in close collaboration with the CIA. Moon and the CIA are the main financiers of the WACL. The Moon Sect owns the majority of the shares of the Washington Times (by registered share) and therefore has this newspaper under its control. Pierre Debizet: SAC leader whose movement was officially dissolved following the Auriol massacre on July 18, 1981. The SAC continues its activities in an unofficial and secretive manner. M.S.I. : Extreme-right wing of the Italian fascist party to which [the extra-parliamentary] "Ordine Nuovo" is attached. Stefano Della Chiaie: Founder of Ordine Nuovo whose relations with Leon Degrelle and his journal "Rex", Guerin Serac, Aginter Press and the Orchestre Noir movement are established. Aginter Press: Agency created by Yves Guerin Serac and Otto Skorzeny. This agency collaborates with the PIDE, the BJSS, the DGS, the KYP and the MSI. Emile Lecerf: Contact of Aginter Press in Belgium, founder of the Jeune Europe movement and Nouvel Europe Magasin. Friend and collaborator of Benoit de Bonvoisin and senior leader of the Front de la Jeunesse, WNP and RTL. Nouvel Europe Magazine: Journal created by Emile Lecerf and Baron de Bonvoisin. Jeune Europe: Mouvement created by Emile Lecerf and Baron de Bonvoisin. Leon Degrelle: Belgian Rexist exile in Spain and top leader of the Nazi movement in Europe. Is in contact with Dr. Mengele (a refugee in Brazil in the Mato Grosso province) who is the Nazi leader for South America and worldwide. In collaboration with Stefano Della Chiea, Yves Guerin-Serac and the P2 group, Degrelle founded the subversive, extreme-right Black Orchestra. Yves Guerin Serac: Captain of the OAS and principal leader of Aginter Press. Orchestre Noir: Subversive movement of the extreme right that was the organizer of the Bologna bombing and involved in similar operations. Klaus Barbie: Nick-named "the butcher of Lyon". Nazi responsible for torture and death under Hitler. Currently incarcerated in France for war crimes. Front de la Jeunesse: Extreme-right group. W.N.P. : Westland New Post. Extreme-right group. One point the reader might want to keep in mind is that the recruitment methods of Opus Dei described above, appear to apply to other establishments as well, at least to a large extent. For example, just look at how uniform the opinions in the liberal establishment are on open borders to the Third World no matter what the cost, the absolute prime focus on combating global warming, or the fact that complete penetration of the conspiracy community with massive amounts of disinformation being spread is completely acceptable. It's quite clear that at the top of society, no matter what establishment one belongs to, that there is basically no room for individual opinion or action. Only after writing the above section pointing out that Opus Dei recruitment methods also go for other establishments, I decided to take a quick look at the biography of Dan Brown, author of The Da Vinci Code, because his work basically is people's only frame of reference on Opus Dei. What immediately stands out is that Brown is a graduate of Phillips Exeter Academy, the most elite boarding school in the United States. In fact, Brown became a professor at this school, is a major donor to this school, and is the son of Richard G. Brown, a 35-year faculty member of Phillips Exeter Academy - from 1962 to 1997. Coincidentally, in the very last article produced by ISGP, "Liberal CIA" Control over the Psychedelics Movement, Phillips Exeter Academy was discussed, because the Rockefellers and some of their closest, elitist friends went there and because the school might be used for recruitment of liberal establishment intelligence assets. Psychedelics and Silicon Valley pioneer Stewart Brand and Facebook's Mark Zuckerberg, who, of course, has also been turned into a huge anti-Trump and pro-open borders policy pusher, were named as examples. 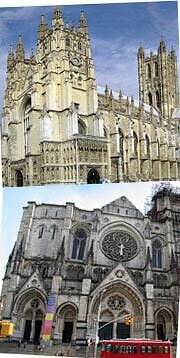 The Anglican Canterbury Cathedral in London and the Episcopal Cathedral Church of St. John the Divine in New York, both staffed by Pilgrims Society members. After Exeter, Brown went to the equally elite Amherst College, which has been attended by more than a few Pilgrims Society members, some of whom later became trustees of this college. On top of that, Brown was raised as a "very religious" Episcopalian, another key trademark of the Anglo-American liberal establishment and its Pilgrims Society. Brown's main character in his Da Vinci Code series of books is symbologist Robert Langdon, named after his long-time collaborator John Langdon, who spent 14 years at the Episcopal Academy in Pennsylvania and had a father who used to be a teacher here. Today Langdon works at Drexel University, named after a major Eastern Establishment and Pilgrims Society family. So, isn't it fascinating that these two devout Eastern Establishment-tied Episcopalians wrote an anti-Opus Dei book? And not just that. With the 2003 book The Da Vinci Code they literally copied the story of Jesus' bloodline surviving through the royal Merovingian dynasty and protected by the Knights Templar and its successor, the Priory of Sion, from the 1982 "alternative history" book The Holy Blood and the Holy Grail. This book also included the "theory" that the Priory of Sion used to have grand masters as Leonardo da Vinci and Isaac Newton. All of it is invented, of course. We could write the original book off as an innocent hoax, were it not that the BBC aided in generating an entire myth about it from the beginning, and that the book's primary author, Michael Baigent, a grand officer of the Pilgrims Society and British royal family-linked United Grand Lodge of England, in 2009 appeared on Coast to Coast AM, a radio show in which basically every single guest is a conspiracy and alternative history disinformer, countless of whom financially backed by the leading liberal establishment families. Starting in March 2003, Laurance Gardner, author of the 1996 book Bloodline of the Holy Grail: The Hidden Lineage of Jesus Revealed, which has the exact same premise as its 1982 successor and The Da Vinci Code, became a frequent Coast to Coast AM guest. Often appearing together with his close associate William Henry, the two have been talking about all the usual disinformation: ancient aliens tinkering with DNA, the Ark of the Covenant representing a weapon of mass destruction, and ancient man having access to wormhole technology and the like. It's amazing material for movies, but all of it is pushed by Coast to Coast AM as being worthy of genuine scientific inquiry. Millions of people are intrigued by these theories as a result. 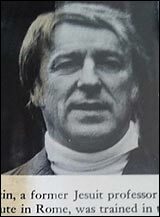 Malachi Martin, an Opus Dei-loyal former Jesuit priest and until his death a regular guest on Coast to Coast AM, there to criticize the Eastern Establishment John Birch Society-style and provide bogus accounts of demonic exorcism. He almost was Dan Brown in reverse. To summarize, one wonders if it is a coincidence that Dan Brown has such deep ties to the Eastern Establishment and that his very non-original (i.e., copied) idea has been pushed to such a large extent that by 2012 he had sold 200,000 books in 56 different languages and had several movies made after his books. We haven't even talked about his Angels & Demons novel involving a conflict between the Illuminati and the (today supposedly moderate) Vatican. How original... and how so not related to Coast to Coast AM. Brown basically is a giant conspiracy myth maker similar to all the guests of Coast to Coast AM - and he is tied to the same interests as so many of these guests. The only difference is that he writes novels instead of "non-fiction". Apart from producing conspiracy myths, Brown's work has also aided in the discrediting of Opus Dei, a group traditionally in opposition to the protestant and science-dominated Eastern Establishment. Brown did so by pushing stereotypes (a repulsive-looking, murderous, religiously-obsessed monk) without really providing any serious insights in Opus Dei. Coincidence or not, this tactic also is extremely common in elite propaganda: discredit your enemies without handing the public any real insights into what is going on. The extreme anti-Trump rhetoric is great example of this tactic in action. Trump and his father represent what ISGP has been labeling the conservative establishment, which throughout the Cold War was allied with Opus Dei and the Knights of Malta through groups as the World Anti-Communist League, the American Security Council and Le Cercle. The exact same thing goes for various other international "populist" candidates, the Le Pens or Britain's pro-Brexit crowd around former Cercle chairman Lord Norman Lamont being great examples of this. Another was the assassinated Pim Fortuyn of the Netherlands, who already had shifted to the neocon side of the conservatives, similar to today's Geert Wilders. Despite the fact that these "populists" are, or were, attacked day and night in the mainstream media, you hear nothing about the bizarre associations of these "alternative" candidates. And thus, we are still left with the question what Opus Dei truly is and the true extent of its past and present influence. Because in modern society, the masses are only allowed to learn about national governments and their interaction between official bodies as NATO, the G8 and the United Nations. Any permanent, supranational, establishment aspects of government are off-limits and shoved aside as "conspiracy theory". One aspect I only found out at the very last moment is that the director and producer of Dan Brown-based movies The Da Vinci Code, Angels & Demons and Inferno has been Ron Howard, best known as the red-headed Richie Cunningham of the Happy Days comedy serie, where he starred opposite "The Fonz". More importantly, Howard is known to have visited the secretive Forstmann Little Conferences in Aspen alongside Henry Kissinger, George Shultz, the Rothschilds, major Hollywood studio bosses and presidents from remote places as Iraq and Rwanda. Howard's mentor, Francis Ford Coppola, together with Steven Spielberg and Howard partner George Lucas, ties back to the 1970s Esalen-SRI conspiracy disinformation network that eventually made its way to Coast to Coast AM. Probably all just a coincidence, these elite ties. Bihay werd met ingang van 25 janauri 1988 overgeplaatst naar de brigade Gembloux. De hoedanigheid van lid van een BOB werd ook hem ontnomen." October 24, 2017, De Morgan (major Flemish newspaper), 'Dossiers verbrand, wapens gepikt, slachtoffers geschoffeerd: onderzoek Waals-Brabant is één grote warboel'. Mistake in the article: Bihay and Balfroid were not removed in 1983 from the Gang of Nijvel investigation, but in January 1988. In 1998 verschijnen er dan de eerste robotfoto's. "Toen was het voor mij honderd procent duidelijk: hij is het. Ik heb meteen gebeld naar de onderzoekscel en heb gezegd dat ik een vermoeden heb over wie de Reus is. Hij was ex-lid van Diane, was een wapenfreak en hij sprak vaak over staatsgrepen. Hij paste in het plaatje." "De dag na mijn verklaring stond er een anonieme auto in mijn straat. Ik woon in een doodlopende straat en die auto stond daar een week lang, elke dag. Met twee mannen erin en het lichtje binnenin aan. Ik ervoer dit als bedreigend en besloot niet meer in het potje te roeren. Ik heb er met niemand meer over gesproken." Pas begin dit jaar durfde Van Damme opnieuw praten. De man kwam toen de broer van C.B. tegen. "Hij zei dat hij had bekend. Toen was ik helemaal zeker. Ik ben toen naar slachtoffer David Van De Steen gegaan. Samen hebben we dan bekeken hoe we het konden aankaarten.""